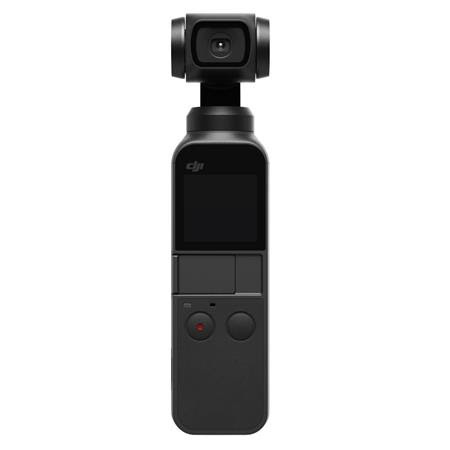 Announced this afternoon at a launch event in Times Square, the new DJI Osmo Pocket is the company’s newest and smallest 3-axis stabilized handheld camera, letting you create cinematic shots on the go. The gimbal, which includes a 1/2.3-inch sensor, can produce 4K/60fps video at 100Mbps and photos at 12 MP, all with a 140-minute maximum battery life. Osmo Pocket transforms all your life’s moments into wonderful images. It snaps photos in stunning detail, thanks to a 1/2.3-inch sensor, 80° FOV, and f/2.0 aperture. It can also shoot 4K/60fps video at 100Mbps and photos at 12 MP with a pixel size of 1.55 μm for footage worth sharing every time. Osmo Pocket boldly embodies the DJI approach to modern technology. The candy bar-sized device was made to be as convenient as your smartphone, wallet, and other daily essentials to offer everything you need for shake-free footage in any situation. Our engineers developed a micro-scale manufacturing process to achieve the smallest 3-axis gimbal in DJI history. This miniaturized mechanical stabilization platform and brushless motor always deliver fine-tuned gimbal control accuracy. For perfectly quiet performance, Osmo Pocket takes advantage of a fanless, passive cooling solution that dissipates heat evenly, ensuring long-term performance and stability. Osmo Pocket includes a Universal Port is the door to further creativity. This multifunctional expansion interface connects Osmo Pocket to your smartphone, as well as an ever-growing suite of accessories that sets you free to film in any way. Osmo Pocket doesn’t just let you shoot smooth, cinematic footage. With access to several intelligent functions like ActiveTrack, Motionlapse, and Panorama, it unleashes your creativity with filming effects that are impossible with smartphones. Recreate the action from your perspective. FPV mode follows the gimbal’s orientation to film thrilling action shots with smooth results. Osmo Pocket is meant for anyone with a story to tell, which is why we developed DJI Mimo. Story mode uses a combination of preset shooting patterns and camera motions to help you create professional-quality video whenever you want. Exclusively-designed filters and soundtracks give a unique finish to your footage. Mimo is the companion to let you point, shoot, edit, and share amazing moments. Osmo Pocket enhances the photography experience with intuitive functions and allows total customization. Pro mode lets you manually adjust camera parameters and adjust exposure. Powerful imaging capabilities also capture RAW format photos and D-Cinelike videos, retaining rich detail and allowing more room for post-processing.DJI Mimo was designed for all types of users to enhance their content with a professional touch. Next Post EGaming, the Humble Software Bundle: Best of Stardock is LIVE!